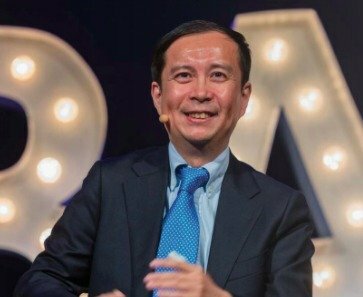 During April, Alibaba Group CEO Daniel Zhang made a flying visit to Australia to meet with Australian partners and participate in some new initiatives by the Australian and New Zealand operation of Alibaba. The interview was conducted by Ticky Fullerton, host of Sky News Business Channel. The Asian Executive attended the meeting which was held at the Plaza Ballroom of the Regent Theatre in Melbourne. TICKY: How would you describe your relationship with Alibaba founder, Jack Ma? DANIEL: I must say that Jack Ma and I have always had an excellent relationship. Jack not just represents the face of Alibaba but also represents the global internet sector and represents China on the world stage. We both have a solid vision that we want to share not just with China but the rest of the world. We built a business together with a team and through it created a lot of opportunities for personal growth and new experiences for everybody. TICKY: How vital is Alibaba to the Chinese economy? DANIEL: Our core commerce platform – the Chinese retail platforms last year generated around USD 550 billion GMV (gross merchandise value) – equivalent to about 12% of China’s total consumption. Our platform reaches 600 million consumers of whom 90% do their transactions on their mobile phones. TICKY: What is Alibaba’s focus in Australia? DANIEL: It’s all about cross-border business. We want to bring Australian products back to China and other markets. We want to encourage Chinese tourists to Australia to enjoy themselves and then to buy more in Australia and bring it back to China. This is the core of what we want to do in Australia. TICKY: Can you update us as to the Alibaba payment system, Alipay, for example for Chinese tourists while in Australia? DANIEL: Alipay is a widely accepted digital wallet solution for Chinese consumers. And when Chinese go overseas, we want them to have this level of convenience where ever they travel. We are expanding our range of partners who can support Alipay all the time. TICKY: Is the so-called daigou market in Australia any threat to e-commerce giants like Alibaba? DANIEL: We have to understand why the daigou market is so prevalent in Australia. It’s a pure market-driven phenomenon. We don’t see this has a challenge but as an opportunity. For us, its all about meeting the needs of 300 million middle-class families and the growing millennial population. TICKY: What are the key aspects you look for in a new Australian partner? DANIEL: Other than seeking the right products, we want partners who want to understand Chinese people and Chinese culture. We then go about coming up with the right solutions to ship suitable products to our customers in China. TICKY: Data security is a hot topic at present with social media platforms, and Alibaba has its own. How do you manage all this data? DANIEL: We are cautious about managing the security of data. We view data as something to help merchants create value, but we also have a responsibility to make sure the data is used in the right way. We invest considerable sums in data security technology and have created strong rules to protect information about individuals. Everybody should learn the lessons about the recent cases emerging from big US tech companies. We need strong standards and robust technology to protect the interest of our customers and our merchants. TICKY: What importance do you place on logistics partners for the success of Alibaba? DANIEL: The customer experience of when and where they receive their products requires a partnership with a logistics operation that can deliver on its promises. It is not our core business to build our own logistics company, but we do invest heavily in logistics platforms to give a positive experience for the customer as best we can. TICKY: Nearly two years ago, Alibaba launched its new retail strategy which includes bricks and mortar shopping outlets. What is the philosophy behind this approach? DANIEL: We firmly believe that the online marketplace and the bricks and mortar world are not two separate worlds – they are but one world. For us, it’s about marrying our technology with the traditional shopping experience. What we see today is that customers love our digital payment system and how goods are being shipped to them and are looking for ways that the retail shopping experience can be designed to catch up with the digital age. In China, we have invested in some of China’s largest hypermarket chains and convenience stores. We even own department stores. We want to introduce more and more Australian products not just through our online platforms and also via bricks and mortar stores. TICKY: There are apparent tensions between the United States and China over trade matters. How concerned are you about this? DANIEL: We firmly believe that free trade is needed for everybody and every country. We have initiated and facilitated worldwide platform initiatives that embrace business partners and government bodies in different markets. Digital commerce should have no geographical boundaries and all people benefit from this. TICKY: So you are an optimist? DANIEL: Yes. It’s all about the marketplace and meeting global demand and giving people a chance to grow through business opportunity.